Slips and falls are by nature unexpected- but the causes are often predictable. Some of the more common reasons for falls include pitfalls, slippery surfaces, obstructions of walkway areas, and stairs. Stairs are one of the most common culprits because they have multiple surfaces on which to slip and stepping to the next level forces the body off balance. The California Uniform Building Code sets out specific requirements for residential and commercial stairs in order to make their everyday use safer. In order to be comfortable for the average human’s height and gait, requirements for stairs are that they be at least 10 inches deep and 4 inches tall, but no taller than 7 3/4 inches. The human brain automatically adjusts to a repetitive walking patter, such as the space between steps. Therefore, the difference between each individual steps’ measurements may not have more than a 3/8 inch variance from the other steps. To accommodate the height and weight of both humans and their belongings, there must be a clearance space above the surface of the stair of at least 6 feet 8 inches and be able to support a 300 pound load. In addition, all stairs with more than four risers must have a handrail installed for the length of the stairs. Handrails may not obstruct the stairs by more than 3 1/2 inches and they must support a 200 pound load. Stairs that are not enclosed on one or both sides must have a guardrail at least 36 inches tall to protect from falls over the side. City ordinances may have stricter requirements and should be researched as well. Property owners have a duty to maintain stairways to prevent loose handrails or well-worn surfaces that leave stairs slippery or uneven. If a problem arises, the property owner should put up a warning sign until the problem can be fixed. 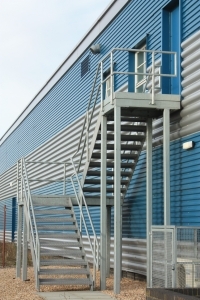 Stairways should be well lit to increase visibility and prevent potential trips. Serious falls can result in traumatic brain injury, broken bones, lacerations and contusions, or even paralysis. A slip and fall victim who would like to pursue a civil action in order to recover costs associated with the fall, such as medical expenses and lost wages should do a basic review of California law to determine if the property owner may be liable for injuries sustained. A slip and fall victim may also recover money damages for pain and suffering. The property owner caused the slippery or dangerous surface or item, to be underfoot. The property owner or an employee knew of the dangerous surface but did nothing about it. The property owner should have known of the dangerous surface because a “reasonable” person taking care of the property would have discovered and resolved the dangerous situation. In addition, the defendant may avoid some or all liability if the plaintiff’s own actions or carelessness contributed to the fall. The best way to evaluate a potential slip and fall case is to contact an experienced personal injury attorney with the facts of the case. The Brod Law Firm is committed to bringing top quality and cost effective legal services to its clients. Please call us today for a free consultation.